On April 23, 2016 the Ada Police Department took a report of a missing juvenile. The incident occurred in Ada, Ohio. According to the report Elizabeth Saracson was spending the night at her sister's on Friday April 22, 2016. Elizabeth was last seen around 10:00pm that night at her sister’s house. 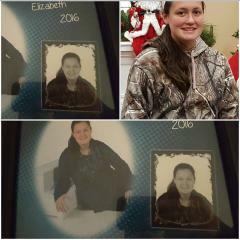 Elizabeth is 14 years old and is a white female with brown hair slightly below her shoulders and brown eyes. Elizabeth has a mole on her neck. Elizabeth is 5’08 and 140 pounds. She was last seen wearing blue jeans, tennis shoes, and a Bowling Green t-shirt. She is also carrying a blue duffel bag with the name “Lizzy” in sparkle letters. It is believed that Elizabeth left on her own accord. If anyone has seen or heard from Elizabeth, please contact the Ada Police Department at 419-634-0010. Please contact the Ada Police Department with any information at 419-634-0010.